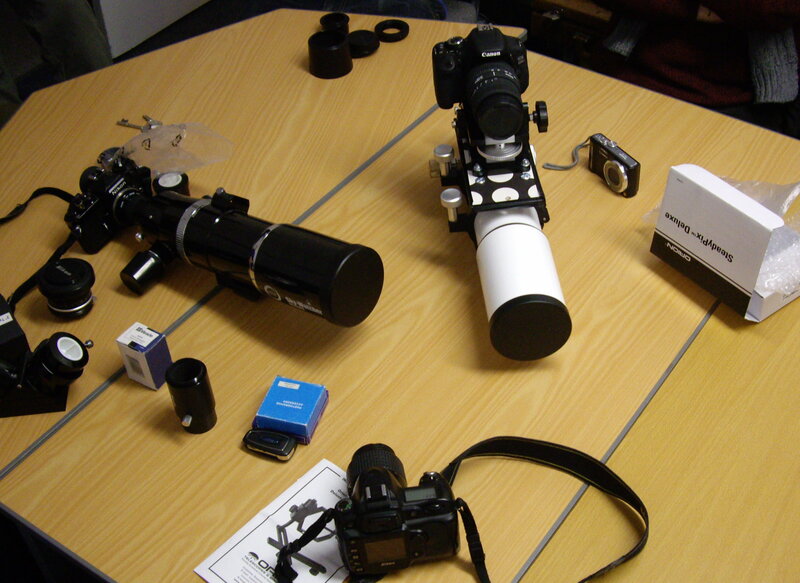 Some of the various bits of equipment members brought along to compare and contrast. Wednesday’s meeting of the Imaging Group was well attended by members and took a workshop format. We had demonstrations and discussion of the various methods of attaching a camera to a telescope, including some troubleshooting for those having issues. There followed a lively discussion of the relative merits of different cameras, webcams and CCD’s used for astronomical imaging. The evening concluded with a video presentation on webcam planetary imaging and image processing. 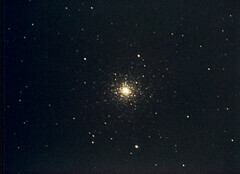 This month we were joined by Tania Johnston from the Royal Observatory Edinburgh. Tania is the Senior Public Engagement Officer and works in outreach with schools and the general public to promote astronomy and the research and technology being developed by the ROE (www.roe.ac.uk/vc). The ASE has worked with Tania and her team on a number of occasions at different events, and it was a pleasure to have her along to one of our meetings. Tania’s talk was entitled “ALMA and Llamas” and was a very interesting account of her visit to Chile which was funded by the Winston Churchill Memorial Trust. The trip was over the course of 6 weeks and allowed Tania to explore the booming astrotourism business, and the various large telescopes which have been built in Chile because of it’s ideal conditions for ground-based observing. 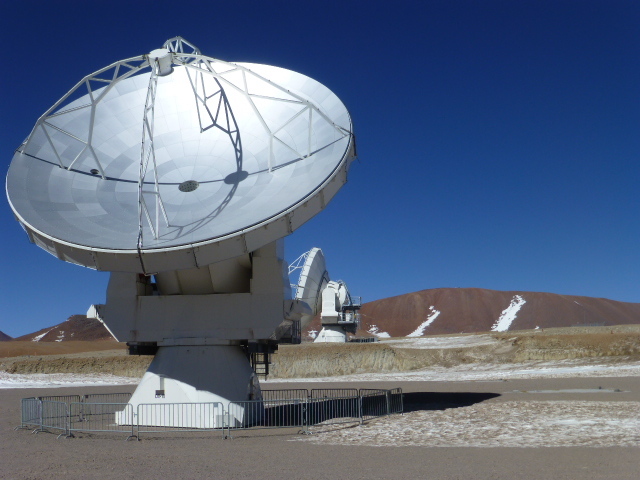 In particular, she was able to visit ALMA, the Atacama Large Millimeter/submillimeter Array, and experience the process of assembling and placing one of the many dishes which make up the array. Our thanks to Tania for coming along to share her experiences with us, and we hope to work with her and the ROE again very soon! Our main interests this month lie in our predawn sky where Jupiter shines brighter than any star and where Mars is in conjunction with the star Regulus in Leo. Sweeping close to Mars is Comet ISON which remains dim at present but may yet brighten to become an impressive sight later in the year.The Summer Triangle of Vega, Altair and Deneb still looms high on the meridian at dusk but has tumbled westwards by our star map times. Trailing behind it is Delphinus where a nova flared in August. That stellar outburst was still just visible through binoculars in late September but was perhaps on the verge of plunging much fainter as is becomes shrouded in dust forming in the wake of the explosion. 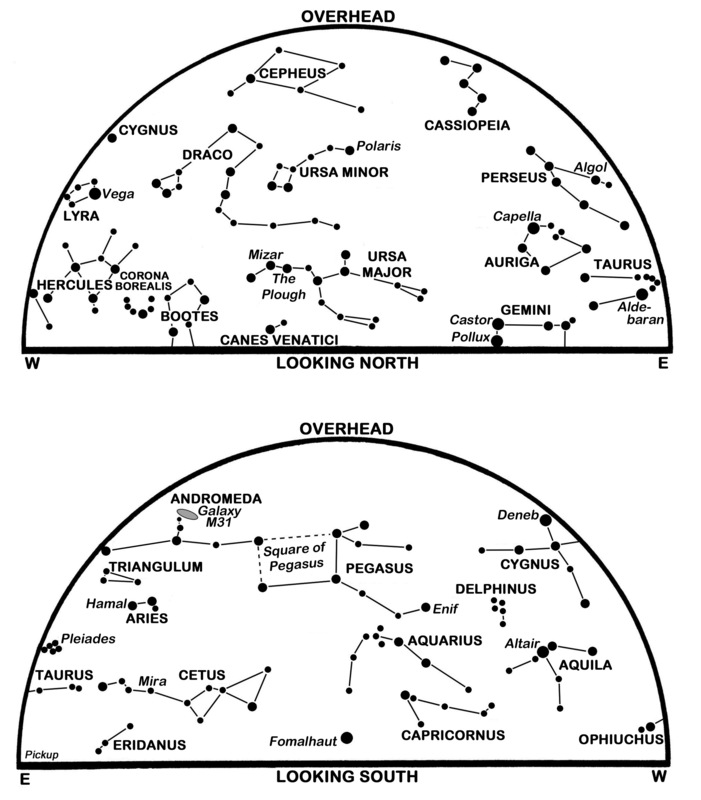 Our charts show the Square of Pegasus approaching the meridian as the Plough rotates counterclockwise below Polaris in the north and the “W” of Cassiopeia nears the zenith. Taurus and the Pleiades are climbing in the east while Gemini is rising in the north-east with the Twins, Castor and Pollux, one above the other. Jupiter stands 8° below and to the right of Pollux and rises less than 30 minutes after our map times, climbing to prominence high in the south-south-east to south before dawn. The planet creeps 2° eastwards during October, passes only 7 arcminutes north of the magnitude 3.5 star Delta Geminorum on the 4th and is above the Moon on the 26th. Jupiter improves from magnitude -2.2 to -2.4 this month and swells from 38 to 41 arcseconds wide if viewed telescopically. Our other pre-dawn planet, Mars, stands above-left of the Moon on the 1st and again on the 30th. Rising for Edinburgh in the east-north-east at 02:27 BST on the 1st and by 01:18 GMT on the 31st, it is climbing well up into the south-east before dawn. From 9° above-right of Leo’s leading star Regulus as the month begins, it speeds eastwards to pass 1.0° north of Regulus late on the 14th and lie 9° below-left of the star at month’s end. It improves slightly from magnitude 1.6 to 1.5 but remains just fainter than the magnitude 1.4 of Regulus. 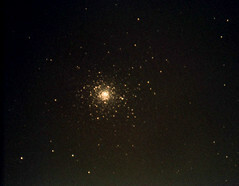 Note, though, the contrast in appearance with Mars being steady and reddish while Regulus is bluish-white and twinkling. Through a telescope, the planet’s tiny ochre disk is 4 to 5 arcseconds wide. Comet ISON remains something of an enigma. Discovered just over a year ago when it lay beyond the orbit of Jupiter, it has been diving towards the Sun on a path that carries it 1,100,000 km above the Sun’s surface on 28 November. Some predictions have it as bright as the full moon at that point, albeit swamped in the Sun’s glare. In fact, its brightening has been slower than most were expecting and it was still a dim 12th magnitude object in late September. Hopes remain that it will be a naked-eye object in mid-November and again during December when it may well sport an impressive tail. Its orbit takes it within 10.5 million km of Mars on the 1st and it is already being observed by spacecraft at the planet. It stands 2.0° above-left of Mars in our morning sky on the 2nd, moving to lie within 0.9° of Mars on the 18th and 6° below-left of the planet by the 31st. We can only hope that it might be visible through binoculars by the month’s end. An unfortunate fact concerning our autumn sky is that planets that lie to the east of the Sun are hugging our horizon at sunset. Take Venus, for example. As seen from Edinburgh at sunset on the 1st, the brilliant magnitude -4.2 evening star stands 135 million km away and 45° away from the Sun but is only 5° high in the south-west. It sets 53 minutes later and should be obvious as the twilight fades, but only if our horizon is clear. Contrast this with Australia where Venus is a stunning object 43° high in the W at sunset and remains visible for almost four hours. The reason, of course, is that the planets never stray far from the ecliptic, the Sun’s apparent annual path against the stars. At present the ecliptic slants low across Scotland’s south-western sky at nightfall as it traces the Sun’s southerly motion until midwinter. By the 31st, Venus stands 5° above Edinburgh’s south-south-western horizon at sunset, shines a little brighter at magnitude -4.4 and is 6° below-right of the Sun’s midwinter position against the stars. As Venus approaches to 101 million km this month, its telescopic diameter swells from 19 to 25 arcseconds while the dazzling sunlit part of its disk changes from 63% to 50%. Look for the planet 4° below the young crescent Moon on the 8th and 1.5° above the red supergiant Antares in Scorpius on the 16th. We have no chance of seeing Saturn or Mercury which are both fainter and closer to the Sun in the evening sky than Venus. This month the Sun tracks 11° southwards as sunrise/sunset times for Edinburgh change from 07:16/18:48 BST (06:16/17:48 GMT) on the 1st to 07:18/16:34 GMT on the 31st. Nautical twilight persists for about 82 minutes at dawn and dusk. The Moon is new on the 4th, at first quarter on the 12th, full on the 19th and at last quarter on the 27th. The southern 76% of the Moon’s disk slips through the fringe of the Earth’s shadow on the night of the 18th/19th to cause a penumbral lunar eclipse. Although only a slight dimming may be noticed, at least the Moon is well placed being in Pisces in the middle of our southern sky. The eclipse lasts from 22:51 to 02:50 BST. This is a slightly-revised version of Alan’s article published in The Scotsman on October 1st 2013, with thanks to the newspaper for permission to republish here. One of the shorter queues for the telescopes! 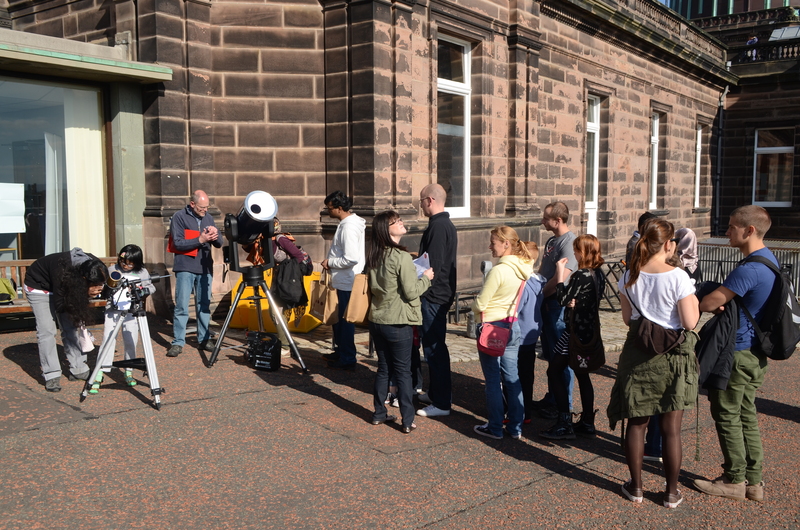 Last weekend, on the 28th and 29th of September, members of the Astronomical Society of Edinburgh turned out to support the annual open days at the Royal Observatory Edinburgh. The Society has a good relationship with the ROE and for the past few years we have been invited to attend the open days to help promote astronomy to the general public, as well as to publicise the Society. Over the course of the two days 3,500 people came through the gates of the observatory and the chance to help enthuse that many people in the subject of astronomy is one that the Society never passes up! Our thanks go to the ROE staff and volunteers who always make us so welcome, and to those members who supported the Society’s attendance at the event through manning telescopes and creating and printing materials for the public to take away. Welcome to the ASE Journal! 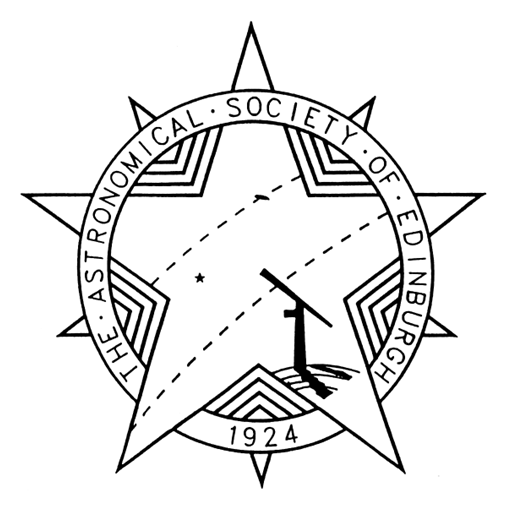 Welcome to the new Astronomical Society of Edinburgh Journal! Some of you will have known the journal in it’s previous incarnation as a quarterly publication distributed to members of the Society. 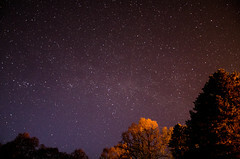 As it was no longer an option to continue in this form, it was decided that an online journal would provide us with the chance to easily reach members with news of the Society and updates on events we have been involved in, as well as providing members with a forum in which to publish articles on their interests and research within astronomy. We all hope that this will prove a useful tool for members and that it will allow us to continue the journal, albeit in a new form.